CooksRecipes has quality, kitchen-tested recipes for French chicken dishes that you can count on for successful deliciousness. A hearty and satisfying French dish, chicken is simmered in a flavorful tomato sauce with onion, garlic, mushrooms and kidney beans with just a hint of orange. 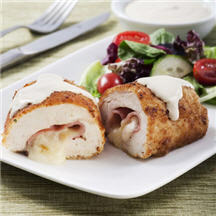 This chicken dish is perfect for entertaining or special family meals when you want a more sophisticated presentation. 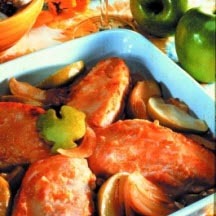 Sautéed chicken breasts are baked with wedges of Granny Smith apple, seasoned with onion, garlic and fresh ginger.